Profiles of Travel Agencies, Travel Agents and Direct Consumers are elements of TravelHerd’s profile management module. They are key to your marketing efforts and sales, so being able to view the history of profiles’ additions and revisions, include the dates attached to these actions, is a very important part of profile management. Profile history and profile date tracking are standard elements of TravelHerd’s profile management. Simply put, all additions and revisions to profiles are now logged in the profile history within your TravelHerd database. 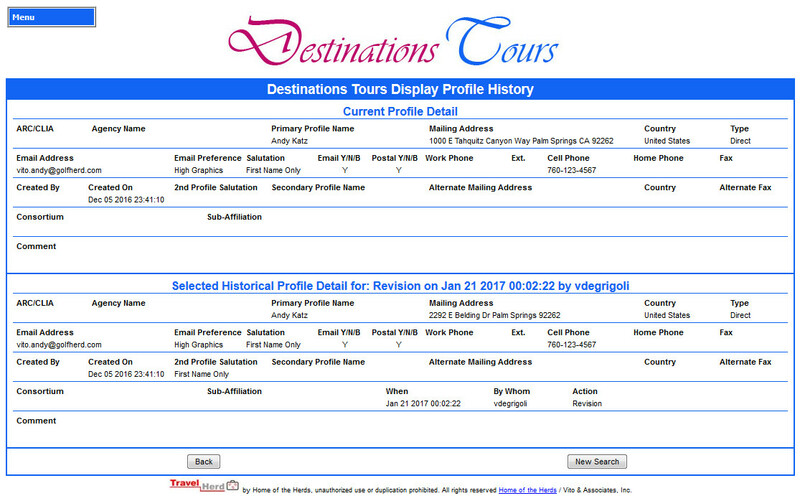 The profile history enables the TravelHerd user to see what revisions have taken place to a profile. Revised profiles display the date and time of the revision and which TravelHerd user made the revision. While it is a truism that “change is the only constant”, it can also lead to confusion when there is no history to fall back on. Fortunately, profile history and profile date tracking in TravelHerd does away with this type of confusion for your staff when dealing with profiles. 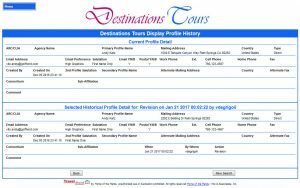 All in all, the profile history and profile date tracking elements of TravelHerd’s profile management module provide key practical information for your Sales and Marketing, Reservations, Accounting and Operations departments.